In the future, the ice caps have melted resulting in the human race having to adapt to living on colonies on the sea. A lone drifter arrives at one of these ‘atolls’ known as The Mariner who trades in ‘dirt’ almost as precious as gold. He is a ‘mutant’ having gills and the community capture him. A gang known as The Smokers lead by Deacon attack the community. They are searching for a girl called Enola who has a tattoo on her back of a map that could lead them to the mythological ‘Dryland’. Saving The Mariner, Enola and her guardian Helen escape. Pursued by The Smokers the three must fight to stay alive and maybe reach the new Eden. Waterworld is almost the punchline of most film jokes, especially when it comes to production costs. Now, I must say that despite the overruns and the multi-millions that was spent, this is a great looking film. Even twenty years later the practical work looks fantastic. It is not surprising that the premise of the film became a Universal Studios Theme Park attraction that is still going today. If you are looking for exciting action and some great looking moments then this film ticks those boxes. If you are looking for an amazing story and acting, not so much. The film is generally nicknamed Kevin’s Gate (mocking Michael Cimino’s disastrous Heaven’s Gate), but unlike Cimino’s film you could argue that at least this film is entertaining. Kevin Costner is in full ‘Robin Hood’ mode and it works as the brooding almost Batman-like hero The Mariner and this is perfectly counterbalanced by the amazingly OTT and insane Dennis Hopper The Deacon. The rest of the cast is just a collection of one note clichés or cameos, which are all fine in general, but nothing spectacular. Jeanne Tripplehorn as Helen is fine, as is Tina Majorino as Enola, but no one else really stands out beyond these three. I always found the film to be an enjoyable one and even later when I discovered all the millions of dollars that made this the most expensive film ever I still felt it was money well spent. It is funny looking back at its budget of $175 Million in comparison to the budgets being spent today. Even adjusted for inflation it does not crack the Top Ten Most Expensive Films (coming in at Number 11) which is currently Pirates of the Caribbean: On Stranger Tides from 2011 with $412 Million? I found watching this time, that I still enjoyed the action and adventure nature of the film. It felt like a big budget blockbuster like something Roland Emmerich or Michael Bay would create. Even if the acting is a little hokey and even if at times it does feel like it is beating me in the head with its message, I still enjoyed the film for what it is. Included in this set are three cuts of the film, the original Theatrical, an Extended TV cut which was heavily censored and a version of this TV cut with the censorship removed known as the Ulysses cut. Now I watched all three, but as with most cuts, I would probably need to watch all three side by side to see what the differences are. Some are obvious and the removal of bad language from the TV cut is obvious, but what I would say is that by including the third cut which is uncensored it kind of makes the TV cut a little pointless. My only issue with these other two versions is simply that almost forty minutes is added to a film that to me already feels too long for the story it is telling and much of what I have noticed as new is not necessary and just slows the film down. However, if you love the film you may welcome more footage. Also included is Maelstrom: The Odyssey of Waterworld which is an almost two hour documentary looking at the creation of the film from script to competition. This was a fascinating thing to watch to see how much effort was put into making the film. One aspect that was interesting to note was the use of CGI and just how little was used. I always find the practical elements of films to be much more enjoyable because I can appreciate the work that was put in. The only person who doesn’t comment throughout is star Kevin Costner, but everyone from Director Kevin Reynolds to the many Producers despite all the challenges clearly enjoyed and are pleased with what they created. Dances with Waves is a quick featurette from the time it was created looking at the making of the film and it has some interesting interviews with the cast and looks at some of the stunts. Global Warnings is a look at the “End of the World" genre taking in many of the films in the past and how Waterworld carried this on. Glen Kenny who is exploring this subject is interesting and maybe if more films had been looked at in greater detail it could have been even better. Two galleries show photos from the Production and Promotional Material which is fine, but nothing special. Finally, included are the Teaser and Main Trailer and TV spots for the film and they certainly do the job at hyping up the film. 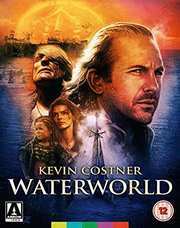 Waterworld is a fun film, but certainly not one that deserves its maligned reputation. When you hear of stories of films being reshot multiple times and barely making their budget back, that is not the case with this film. The film did not waste money due to a Director’s excesses or an Actor’s demands or one that flopped at the Box Office. This is a film which found its audience and every penny is clearly shown on the screen. It will never be called a masterpiece, but it was certainly not a waste of money. If you have never seen the film and you enjoy the films of people like Bay and Emmerich then I have no doubt you will enjoy this film and if you do already enjoy it the two alternate cuts have almost an hour of extra footage for you to enjoy even more. So what are you waiting for? Dive in!